The beginner collector of Russian cigarette cases sometimes finds a strange looking container whose purpose is not immediately clear: the cigarette case with tinder cord and match/striker compartment. "Because of the missing pencil I can give you the case for half of the regular price" or "The carrying chain for this lady's case is lost, but....". The solution of this riddle is very simple when you know the social background and a little story of the origin of these fascinating objects. When, after the Crimean War (1853 - 1856), cigarette smoking became more and more fashionable (previously tobacco was only chewed, snuffed and smoked in pipes or cigars), the silver manufacturers began to switch their production from snuff boxes to cigarette cases. They had to insert into their new designs a space for the safety match, the invention patented in 1852 by Swedish engineer John Edvard Lundström and highly appreciated by its users. 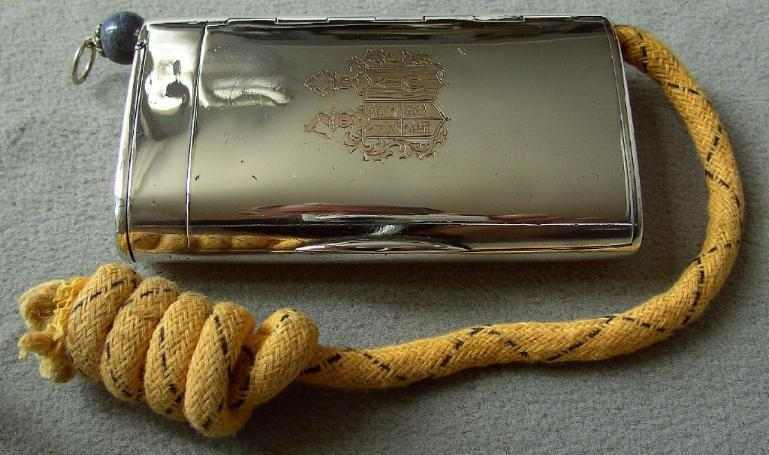 What could be simpler than making a cigarette case with a storage for matches and, of course, a striker plate? But then, what purpose had the drill hole going from one end to the other end of the case? In this hole a tinder cord was inserted, a device well known from the first, simple lighters. 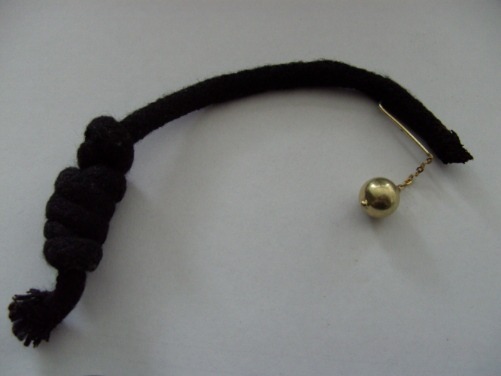 The tinder cord had a tiny hook, a little chain and an end or lid in the form of a ball, pearl, semi precious stone etc. to close the opening after use. At that time the new, fantastic, useful matches were very expensive. To save matches (and money) the usual procedure was as follows: one pulled a certain length of the tinder cord on the ball or lid out of the hole, took a match, ignited it and made the tinder glow. Now you could lighte as many cigarettes as you wanted. After use the tinder cord was simply drawn back, the ball or lid sealed the opening and the flame was extinguished by lack of oxygen (see ENDNOTE on bottom page). Not only were the cigarette cases made in this form. Also the separate match holders were constructed in the same way. 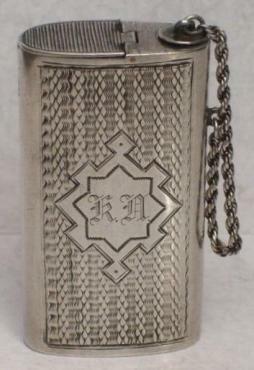 The production of this form of cigarette cases ceased in the 1910s, after the invention of the gasoline lighter. In a cigarette case with a tinder cord there was a hollow tube running through it on one side. After the tinder cord was threaded through this tube, one end was hooked to the ball (see below) so it could not fall out. 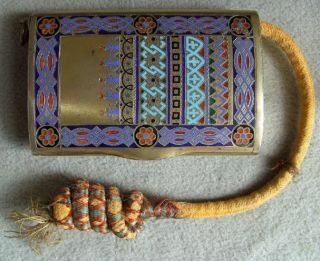 The extra cord hanging out at the bottom of the cigarette case was wound up or knotted to serve as a continuing replacement. 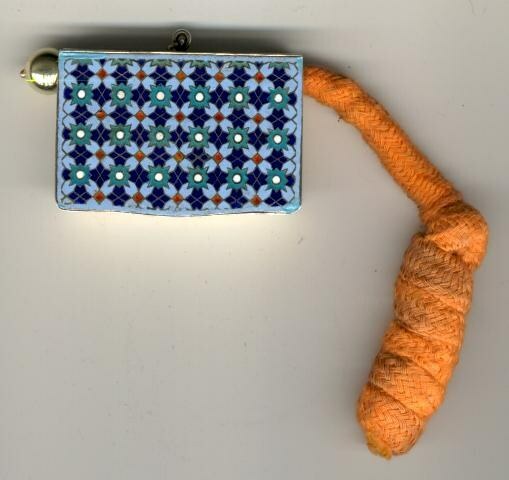 1: The tinder cord (or the lid with a ring) was pulled up about 4 cm above the case. 2: A match was struck and held to the exposed end of the tinder cord until it began to glow. 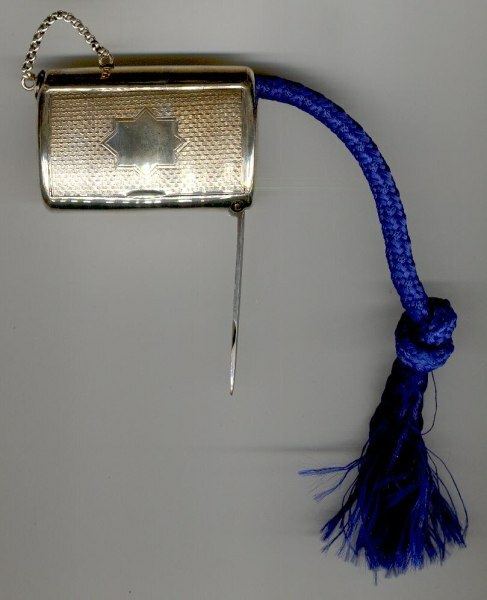 3: The cigarette case with the glowing tinder cord was handed to others to light their cigarettes. 4: After lighting every cigarette, the cigarette case was returned (hopefully). The knotted end of the tinder cord was pulled until the glowing end disappeared into the tube, which was sealed by the ball or other lid. The cord end was extinguished by a lack of oxygen.